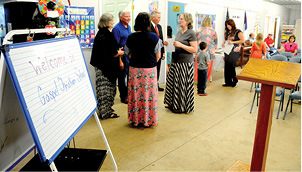 The Gospel Christian School held its open house on Monday, July 23, in the GCS school house. Several people were on hand Monday night to tour the facility. Principal Marcus Williams said as of right now there are 15 students enrolled at the school, which is a larger number than last year. This year will be the second year the school has been in session. Williams said the Gospel Christian School has daily prayer and devotion as well as chapel services once a week. Williams’ wife, Tracey, as well as Kimber Thompson, teach the students at the Gospel Christian School. 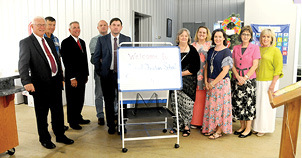 Below, from left to right are, Board members Bob Sawyer, Lonnie Pyles and Melvin Daniels, Darolyn Albertson, Principal Marcus Williams, Jewel Pyles, Kimber Thompson, Tracey Williams, Veta Daniels and Debbie Cross.